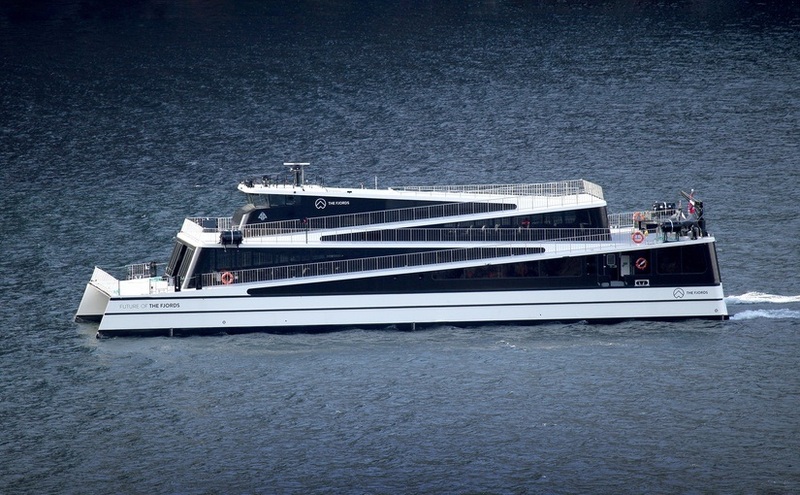 The passenger ship «Future of The Fjords», built by Brødrene Aa for the shipping company The Fjords, is the Ship of the Year 2018. The prize was awarded by Mr. Petter Ølberg, Norways ambassadors to Germany , during SMM in Hamburg. 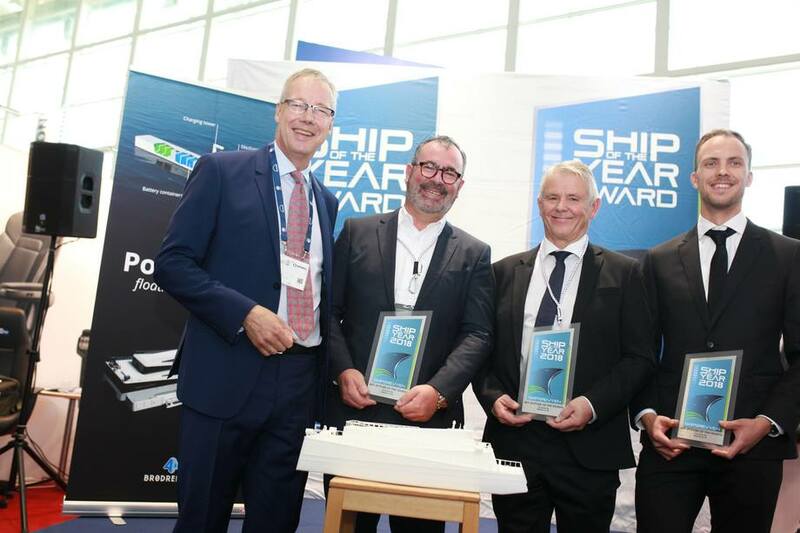 "An innovative winner which demonstrates the best of what Norwegian-developed green ship technology can bring," says Gustav-Erik Blaalid, chief editor of Skipsrevyen. Future of the Fjords is a fully electric, Norwegian developed and built passenger cartamaran, the construction material is in carbon fiber and the ship is 42 meters long. The contract value is approx. NOK 144 million. The ship has a fully electric propulsion system consisting of two electric motors of 300 kW each. The vessel traffics the Nærøyfjord, thus contributing to zero emissions in the world heritage fjord. The jury emphasizes that, in addition to fully electric operation, a strategic concept encompasses a PowerDock (a floating dock with vacuum mooring system) illustrating the thorough, conceptual work the developers have done to lift sustainable marine transport to new technological heights. The PowerDock is an effective 2.4MWh battery capacity that can act as a power charger for multiple types of vessels. In addition, it can receive sewage and greywater. The jury acknowledges M / S «Future of The Fjords» as a comprehensive concept where innovative vessel development goes hand in hand with a completed strategy to make the fully electric vessel concept possible at other locations as well. The PowerDock resolves a potential barrier to making more rural areas available for electric vessel operations, eliminating the need for land-based and expensive charging stations. The problem of infrastructure seems resolved in an exemplary manner. The interaction boat + battery bank ensures real zero emission operations (neither air nor sea, nor no noise). In this way, the concept (vessel + battery tank with tank capacity) is judged by the jury as an accelerator for the green shift. The jury expresses great recognition to the parties who have developed and, in fact, implemented a technological and economic boost that the «Future of The Fjords» and the Powerdock imply. The jury concludes that building number 291 from Brødrene Aa AS to The Fjords DA meets the expectations that will be made for the Ship of the Year. Overall, the combination of futuristic vessel technology and the level of innovation in the battery bank is considered as triggering for M / S «Future of The Fjords» as the Ship of the Year 2018.